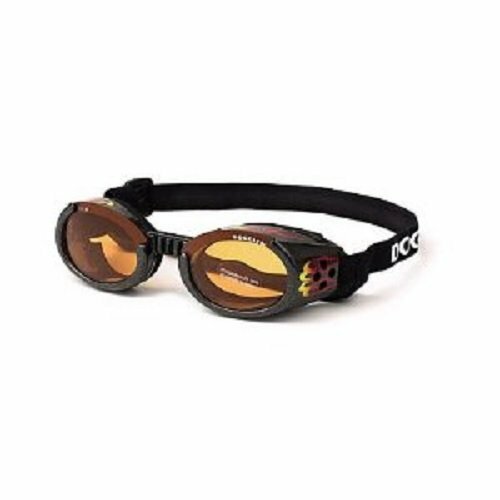 Doggles ILS are the first and only protective eyewear designed just for dogs. 15 Years of experience has made our Doggles ILS (Interchangeable Lens System) the very best in pet eyewear. For eye protection or fashion, ask for it by name. Sizing: To determine proper size, measure the entire head circumference across the eyes around the entire head under the ears. To determine proper chin strap length, start measurement just under one ear, go under the chin and up to bottom of other ear. Extra Small - For dogs 1 to 10-pound / Back strap and frame length - 5 to 13-inch / Chin strap - 3 to 7-inch Extra Small Breed example: Chihuahua, PomSmall - For dogs 9 to 25-pound / Back strap and frame length - 12 to 20-inch / Chin strap - 4 to 8-inch Small Breed example: Beagle, WestieMedium - For dogs 20 to 60-pound / Back strap and frame length - 15 to 25-inch / Chin strap - 5 to 11-inch Medium Breed example: Dalmation, Border CollieLarge - For dogs 50 to 100-pound / Back strap and frame length - 18 to 30-inch / Chin strap - 6 to 15-inchLarge Breed example: German Shepherd, Labrador RetrieverExtra Large - For dogs 100 plus-pound / Back strap and frame length - 22 to 45-inch / Chin strap - 11 to 26-inchExtra Large Breed example: Large Rottweiler, St. Bernard.